Tōgō Heihachirō (1848-1934) - Though the opening of trade relations with the United States was technologically beneficial to Japan, the ease with which Commodore Perry forced his way into Japanese waters alarmed officials. Tōgō Heihachirō was five years old when Perry made his famous voyage, and ten years after the Treaty of Kanagawa was signed, Satsuma Province established Japan's first modern navy. Tōgō became one of its first sailors (along with his brother). In 1868, he saw his first combat action at the Battle of Awa during the Boshin War (a civil war between the Tokugawa shogunate and a revived imperial force). Satsuma fought on behalf of the imperial court, which was victorious. The victory restored the emperor (Meiji) to power which proved fortunate for Tōgō. He was promoted to officer and chosen to study naval tactics in England, the greatest maritime power in the world at the time. He stayed for seven years from 1871 to 1878 (and obviously learned English in the process). While serving aboard the Hampshire in 1875, he circumnavigated the globe, possibly becoming the first Asian to do so. After returning to Japan, he had an opportunity to study naval tactics in action during the Tonkin War (between France and China). A decade later, he fought in his first foreign conflict during the Sino-Japanese War. As captain of the cruiser Naniwa, he participated in the Battle of Yalu and earned the rank of rear admiral for his efforts. Then came the Russo-Japanese War in 1904. Tōgō was appointed Commander-in-Chief of the Imperial Fleet and played a major role in Japan's shocking victory. 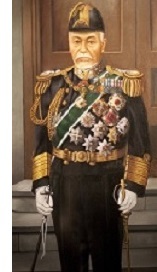 Toward the end of his career he was made Admiral of the fleet (gensui in Japanese) and was a primary factor in transforming Japan's navy from virtual non-existence into a world power. In the West he was referred to as the "Nelson of the East" (referring to Admiral Lord Nelson), and even wrote in his memoirs, "I am convinced that I am the reincarnation of Horatio Nelson."